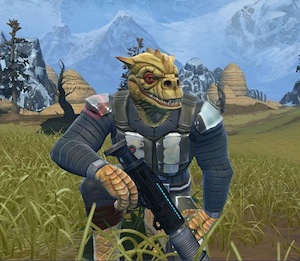 Trandoshan (Humanoid), Gormak (Humanoid), X2-C3 Imperial Astromech (Droid), AR-34 Enforcer (Droid), Gundark (Creature), and Salky Hound (Creature). For me, the population of a given area in an MMO is so important for the playing experience, and the rich lore of Star Wars ups the ante on this further. The six shown today, on top of others announced to date, seem to bode well for this aspect of the playing experience.